This trend came out of nowhere. I remember I saw it first on Kim Kardashian's IG. Even though I'm not the biggest fan, I can appreciate her as someone who isn't afraid to try new trends. 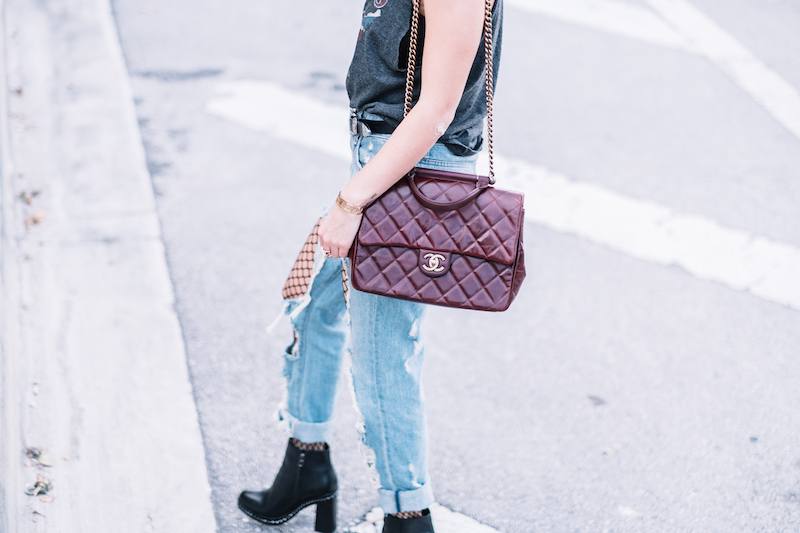 There's something super edgy about this trend, but there are ways to adjust it to your personal style. For example, last month I showed you how you can wear lace tights instead of fishnets if you are more romantic or girly. But let's focus on fishnets today. I want to to give you some tips to take full advantage of the fun pair you purchase (which btw are under $10 in most sites...you all know how I love an affordable trend!). Esta tendencia salió de la nada. Honestamente recuero haberla visto pro primera vez en el Instagram de Kim Kardashian- de quien no soy la mayor fan pero si aprecio la manera como no tiene miedo de probar nuevas tendencias y vitalizaras como nadie. Estas medias me parecen muy edgy, pero hay maneras de ajustar esta tendencia para que vayan con tu estilo. Por ejemplo, el mes pasado les mostré como pueden usar unas medias de encaje si tienen un estilo más romántico. Pero hoy me voy a enfocar en las medias de mallita. Estas las pueden encontrar en muchas páginas web por menos de $10. Es decir, son una manera sencilla de actualizar cualquier look por poco dinero. The first thing you must take into consideration is what size of the net you feel must comfortable in. There are tiny tiny fishnets while others are quite big...I consider mine in the medium range. Being 100% honest, I got mine with my birthday costume and I thought I would never wear it again because I always thought they were costume...boy, I was WRONG! 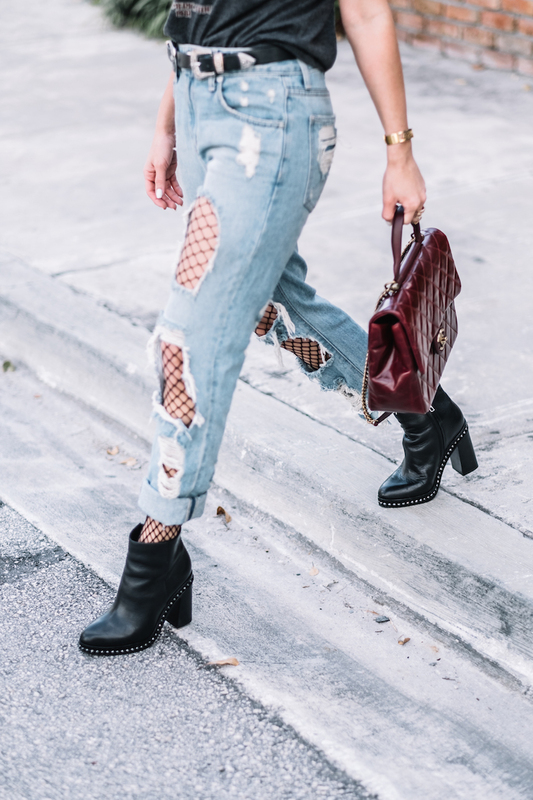 Don't think about fishnets as an "added layer for warmth" (because they don't really keep you warm); think of them as a way to add texture and depth to any look. 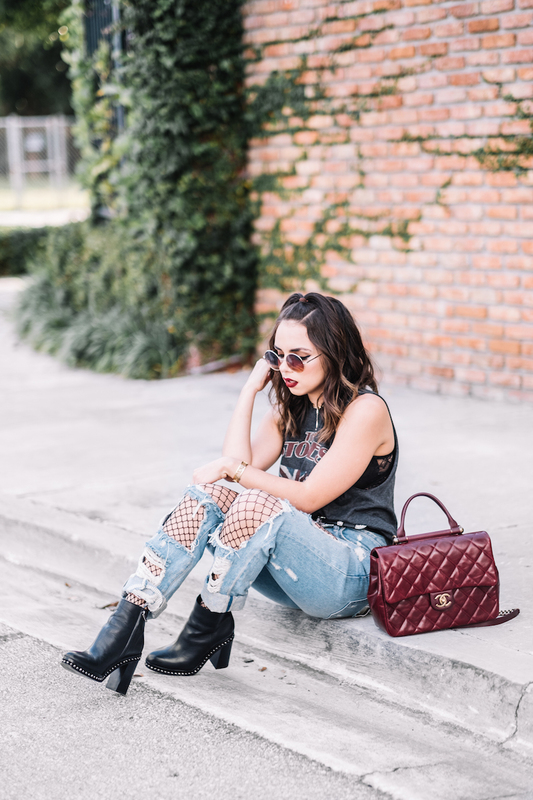 If you still want to try this trend for Summer, you can go for fishnet socks: just as fun and perfect with summer dresses or shorts! Lo primero que debes tomar en cuenta es el tamaño de la malla: ¿te sientes más cómoda en las mallitas pequeñitas o te arriesgas a las que son más grandes". Considero que las mías son intermedias. Me preguntaron mucho que donde las conseguí, y la verdad es que vinieron con un disfraz que usé en Halloween. Pensé que nunca las volvería a usar...pero me equivoqué 100%. Tampoco lo veas como que estás medias te dan una capa extra de calor (porque realmente no la dan...pasaron la prueba al usarlas en Miami). Velas como una manera de darle textura y dimensión a tu look. Para el verano también puedes considerar las medias de fishnet, y se ven muy bien con vestidos y shorts veraniegos. - Show them off! 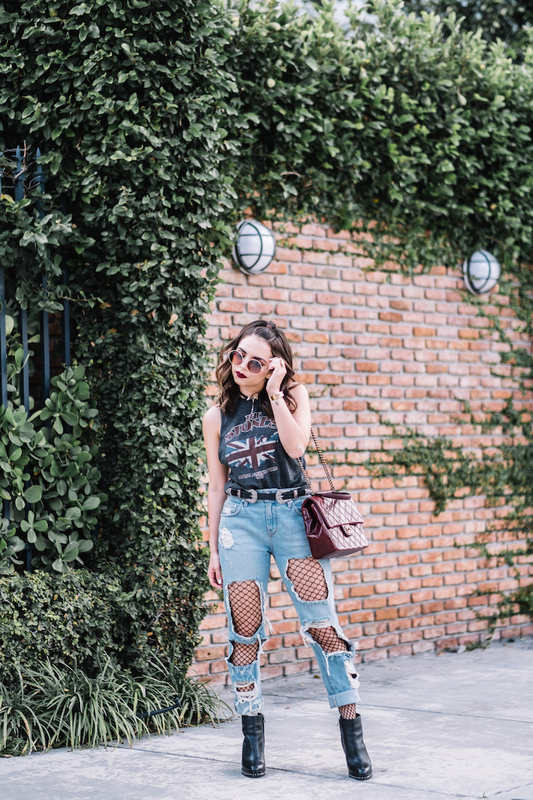 They look so fun when they peek through ripped boyfriend jeans; it could be just a little rip in the knee or full-on ripped jeans like the ones I'm wearing. You can also wear them with non-ripped jeans but wear a cropped top and let the fishnet peek in the midriff OR on your ankles. - When it comes to shoes, I especially love how they look with sneakers or boots- BUT I've seen some killer looks with pumps. I would keep the shoes closed (no sandals!) or a tiny tiny peep toe. - For tops: have fun! I went for the rock&roll vibe with a rocker tee! 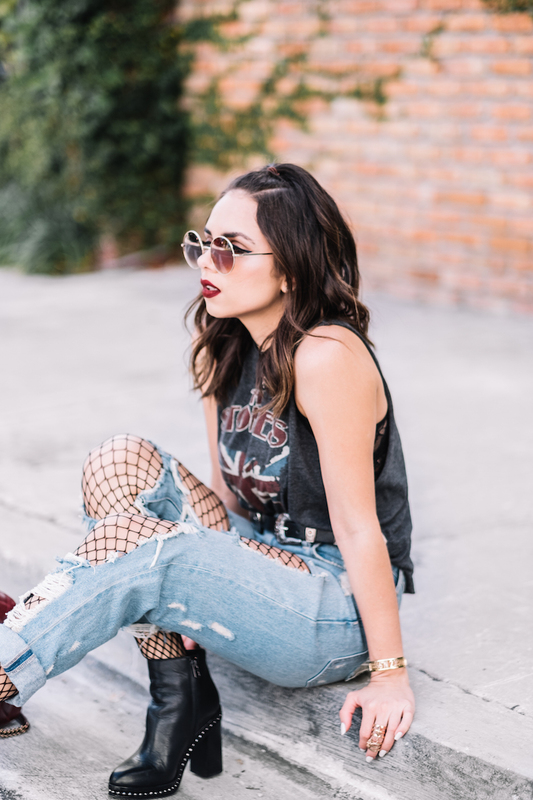 The most important thing is that you feel comfortable and rock those fishnets like are part of you! - Deja que se vean. Como dije, le da dimensión a un look cuando se ven en los ratitos de un jean (sea un pequeño roto en las rodillas, o mega rotos como los que llevo puestos ene estas fotos). También puedes usarlas con jeans regulares y deja que se ven en tus tobillos o en la zona de la barriga. - Cuando se trata de zapatos: a mi me gusta mucho como se ve con zapatos de goma o botines- PERO he visto unos looks increíbles con pumps. Mantén el zapato cerrado (nada de sandalias!!. - En cuanto a las camisas: arriésgate. Yo me fui por la onda roquera pero lo importante es que tu te sientas cómoda.